So, um... I sort of fell of that Year of NES thing, didn't I? First Spring Break came, which interfered with playing games and writing them up, then I took a while unpacking stuff and getting set up again, and then finals started looming and, well... here we are. But now I am motivated and focused and ready to talk about another game! To the extent I can remember it. 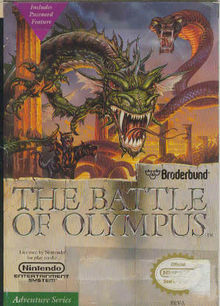 The Battle of Olympus was released by Brøderbund in 1988. Yes, Brøderbund! The Carmen Sandiego people! It turns out that, in addition to publishing a variety of quality edutainment titles, Brøderbund also publishd a number of Japanese games in the US for companies that had no American arm. This wasn't an uncommon side-business for American software companies in the 80s; Sierra On-Line, of King's Police Space Quest for Glory fame, published a few Japanese games in its early years, like Thexder and Sorcerian. This explains why the game's plot is so very... odd. You play Orpheus and are trying to rescue Euridice from the underworld. To do so you must fight a hodge-podge of different monsters from Greek mythology. The mythological elements don't really fit together in a coherent way; you're left with a sense that the game's developers just threw in a slew of names from Bullfinch's Mythology at random. It's jarring to meet Prometheus and be told that his town is under seige by the snake-woman Lamia, but that if you can defeat her he'll give you the Staff of Fennel, which you can use to fight enemies. And which shoots fire! And all of this from the same company that brought you Where in the World is Carmen Sandiego?. Brøderbund might have worked a bit harder on the translation. The game's various puzzles are obtuse enough without dialogue like "Here is the sandals. If you can find my father he knows how to use it," and "There may be a crystal ball that helps you see invisible things." In a way, it adds to the sense of accomplishment when you find something and figure out, retroactively, what the game's characters were trying to tell you. Nonetheless, once the retro charm wears off wrestling with terrible translations is one of the less fun aspects of playing older games. So how does Battle of Olympus play? Exactly like Zelda II: The Adventure of Link. I played this game a lot as a kid and somehow never caught on to the fact that it was a Zelda II rip-off. Before picking it up again I'd heard people mention this fact occasionally, but I generally rolled my eyes and wrote them off as too cynical for their own goods. But no! It's Zelda II, only now Link's wearing a tunic and a wreath of laurels! The animation is the same, the controls are the same, the single-screen houses are the same, even some of the graphics are out-right stolen from Nintendo. It's Zelda II in ancient Greece. Stepping back a bit, it's hard to really evaluate Battle of Olympus. As I played it, I realized that game design philosophy has really fundamentally changed since it was made. If you play a modern game, you'll find it's trying to be fun from the moment you turn it on. Modern games seek to engage the player and give them interesting things to do from start to finish. Battle of Olympus, and a lot of other games from its era, is a chore. The game is designed to be a challenge. The fundamental relationship between developer and player has changed since Battle of Olympus was made. Modern developers see players as consumers looking for entertainment, and ask "what can we do so that players will have fun?" Developers of the 80s saw players as adversaries, and asked themselves "How many roadblocks can we place between players and the goal of beating the game?" Modern designers make games to be fun; designers of the NES era made games to be hard. I played Battle of Olympus a lot before writing this. I'd estimate I spent maybe 10 hours plugging away at it in my week with it, and I got maybe half-way through the game. In all the time I spent playing it, I can honestly say I never had any fun. At no point did the game cause me to feel joy. I felt no exhileration at what I was doing. What Battle of Olympus did make me feel was satisfaction. I died dozens of times trying to beat the Cyclops in Pelopennesus. When I finally beat him and got some bauble that made my incredibly vulnerable avatar marginally less weak, I was pleased with myself. The game had been beating me, hard, and I had just hit back. Ultimately, I don't think Battle of Olympus is a very good game. The fact that it's challenging and not fun throws the shift in design philosophy into sharp relief, but that doesn't excuse the fact that it isn't fun. There are a lot of other game from the era that managed to be both challenging and entertaining. I wouldn't pay more than $2 for Battle of Olympus. It's not terrible, there's some enjoyment to be squeezed out of it if you're willing to work at it and take pleasure in surmounting punishingly hard video games, but it isn't particularly worth it if there are more entertaining alternatives. No musical selection for this game because the game's music is wholely foregettable. The one exception: When you enter a God or Goddess's temple the music that plays is an 8-bit chiptune rendition of Bach's Toccata and Fugue in D-Minor. Odd, considering that the piece wasn't written until around 2000 years after when the game is supposed to take place, but interesting and unique nonetheless. This page contains a single entry by Zach published on May 3, 2007 9:46 PM. Tax Freedom Day was the previous entry in this blog. The Busiest Damn Week of These People's Lives is the next entry in this blog.